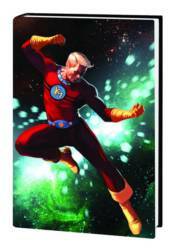 By shouting the famous name of his hero, Marvelman, the orphan Dicky Dauntless assumes the form of the redoubtable Young Marvelman! Watch as the Mightiest Boy in the Universe metes out atomic-powered justice to robot bandits, underwater pirates, foreign revolutionaries and more in his earliest adventures! Collecting YOUNG MARVELMAN #25-34 in the original black and white.